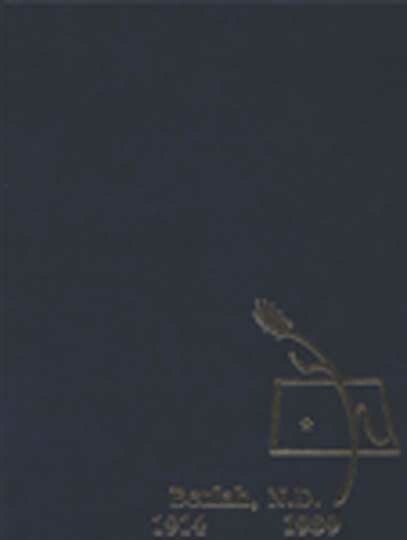 This 75th Jubilee book for Beulah, North Dakota includes in the Table of Contents: 1) The beginnings of a townsite; 2) The need for good roads and services; 3) Beulah braves depression, drought and grasshoppers; 4) The war and weather; 5) Peace and the beginnings of prosperity; 6) Years of growth and expansion; 7) Energy impact infuses new life; 8) Good planning pays off for Beulah; 9) Pulling together for the future; 10) A community of faith; 11) Business community; 12) Helping hands; 13) And the people. 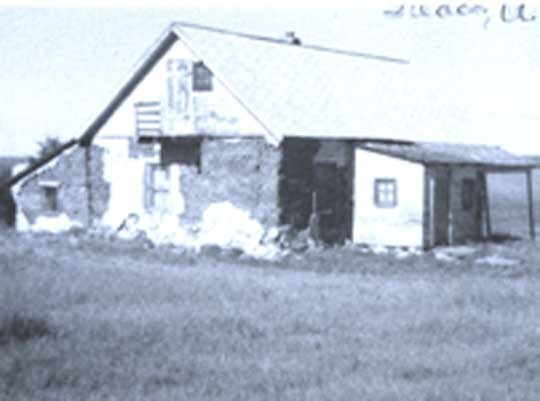 The Scheid homestead, where all the Scheid children were born, was like many other sod houses which sprouted on the prairie during the early days when the settlers came. 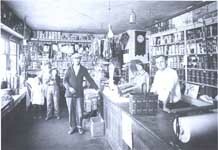 Fred Flemmer, right, served customers in a grocery/dry goods store in Beulah's early days. 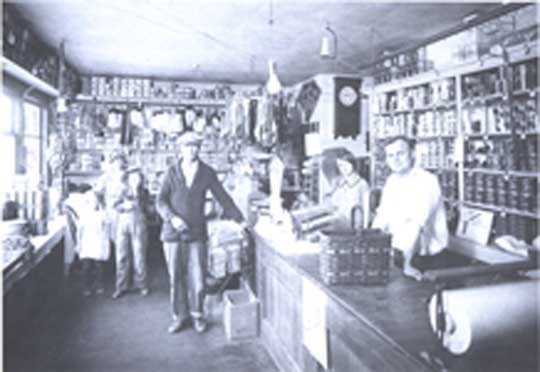 Note the gloves and socks hanging from the ceiling and the canned goods on the shelves. 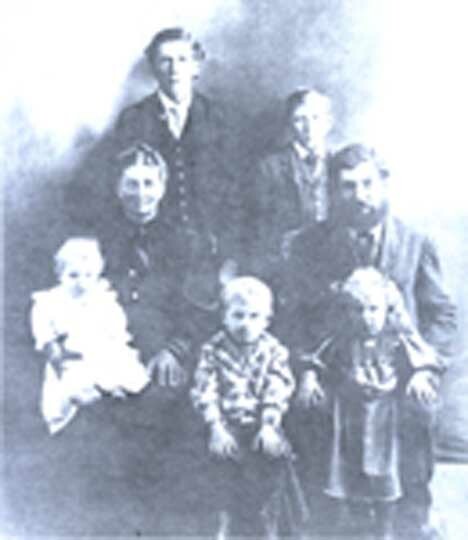 The Family History section for pages 212 to 352 include these German names: Aberle, Allmendingers, Bauer, Becker, Bentz, Betz, Blohm, Boecktel, Brecht, Brunmeier, Buchmann, Buscher, Christmann, Dettmann, Eisenbeis, Entzel, Erdman, Fischer, Flemmer, Frank, Froescher, Goldade, Gunsch, Hafner, Hauff, Hausauer, Heihn, Heine, Helm, Herman, Hilz, Hoepfner, Hoffmann, Horning, Huber, Jaeger, Just, Keller, Kessler, Kittler, Kittler, Krausz, Krieger, Kruckenberg, Kuch, Kusler, Liebelt, Mattheis, Menge, Miller, Mittlesteadt, Mitzel, Mohl, Moos, Muhlhauser, Murschel, Mutzenberger, Naas, Neuberger, Oberlander, Orth, Ost, Oster, Pfenning, Pischel, Raszler, Reich, Rettke, Reub, Rueb, Sackman, Sailer, Sayler, Schaper, Scheid, Scheidt, Scherbinske, Scherer, Schielke, Schlager, Schmidt, Schnaidt, Schneider, Schock Schopp, Schulz, Schumacher, Schumaier, Schutt, Schweitger, Seifer, Spier, Teske, Unruh, Unterseher, Voegele,Wallender, Walz, Weldner, Weigum, Weil, Wolf and Wolff. This photograph taken before 1920, depicts a "wagon mine," a small operation which strip-mined coal for domestic use by farmers and townspeople. This one was owned by John Henderson. Mattheis family. Back row: Emil, Emanuel, Anna, Rudolf, Bertha, Mr. and Mrs. Emanuel Mattheis. 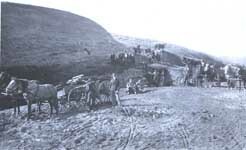 Emanuel Mattheis Sr. was born in 1867 at Brienne, Bessarabia.